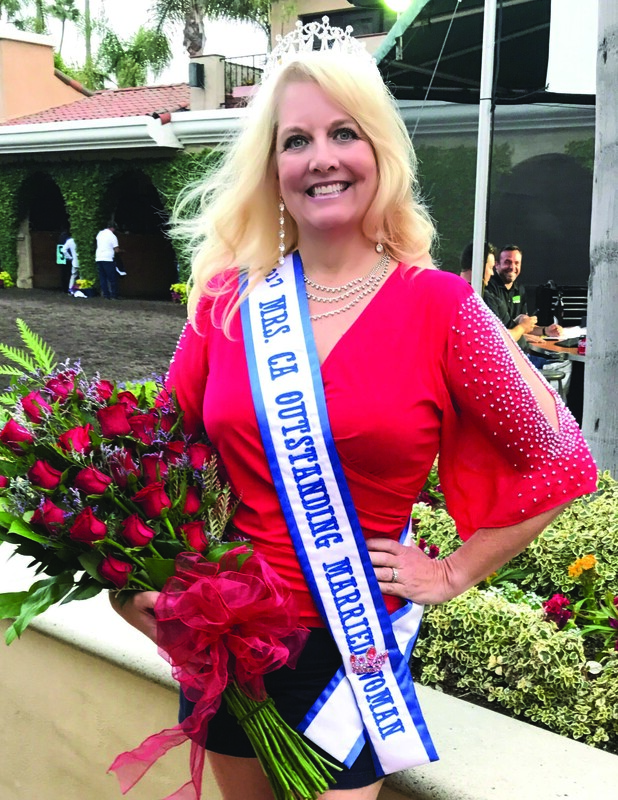 CARMEL VALLEY — When a pageant director suggested Carolyn Kirner compete for Mrs. California, the Carmel Valley resident was intrigued. However, there was one small problem. Kirner and Chuck Schmidt exchanged wedding vows in 2015 and this past October she took the first step on that journey when she was crowned Mrs. San Diego 2017. Although she didn’t win the Mrs. California-America Pageant in June, she became the first San Diegan to be named Mrs. California Outstanding Married Woman, an award given to a woman who has shown exceptional courage in her life, been exemplary in her community service efforts or portrayed a special attitude that sets her apart from others. To that end she will continue making appearances throughout the county to promote Victoria’s Voice Foundation to help reduce overdose deaths, something she encountered during her time as a paramedic. “You basically had to scoop them up and head to the hospital and pray you got there before they died,” she said. “As a paramedic I remember how frustrating that was. Victoria’s Voice is raising money so all first responders can have (the drug) that can reverse the overdose. Kirner-Schmidt is also committed to “helping one woman at a time” as an attorney, a second career she initially doubted was attainable. She gave up her paramedic job when she married her first husband and became a stay-at-home mom. Eleven years and three children later, she said, her spouse decided he didn’t want to be married anymore. She said she had once thought of becoming a lawyer but didn’t believe she was smart enough. As a single mom, she also didn’t think she had the time or money. Additionally, she was three courses short of an undergraduate degree. With support from family and friends and a scholarship to attend Trinity Law School in Santa Ana, Kirner-Schmidt decided to go for it. She made the 80-plus mile commute to college from Carmel Valley, sometimes taking her kids with her. The first year she took classes concurrently at San Diego State University to earn her bachelor’s degree. “I studied in the bleachers of my son’s baseball games and on the grass at soccer games,” she said. “So now, when my clients say they can’t do something, I tell them they can. Occasionally, Kirner-Schmidt puts her money where her mouth is. Kirner-Schmidt competed in beauty pageants when she was younger but never thought of pursing it further than that. In 2005, while attending a Mrs. America event to support a friend who had been named Mrs. New York, a director suggested she try for the Mrs. California title. The first step, after her wedding, was at the local level. She was crowned Mrs. San Diego in June 2016 and visited nearly every community to raise awareness and funds for her charity and others. She judged a chili contest, greeted participants at the Red Nose Run and presented flowers and a trophy to the owner of the winning horse at the Del Mar Racetrack. One of her most memorable events was Sip and Wrap, a fundraiser for Connor’s Cause for Children that helps the families of critically ill or injured children. She and her daughter recently collected diapers, clothes, bottles, blankets, wipes and toys for “the tiniest Hurricane Harvey victims” in Texas, where her granddaughter was born. “Seeing tiny little babies struggling with the flood waters has really touched my heart,” she said. As Mrs. California Outstanding Married Woman, Kirner-Schmidt can compete for the title of Mrs. California-America again in 2018. The pageant includes a swimsuit competition, during which participants must create a mask that represents them and explain why to the judges. The women are also scored on their evening gown choice and answers during an interview session. But Kirner-Schmidt said it is not simply a beauty contest. “You think that beauty pageants are just a bunch of pretty, self-centered women,” she said. So for the next 10 months or so, Kirner-Schmidt will make appearances throughout the county, wearing her crown — a replica of one worn by Princess Diana — and promoting her charity. Should she win Mrs. California-America, she would go on to represent the state at the Mrs. America pageant. The winner of that will compete for Mrs. World.